Is Your Smile Ready for a Spring Renovation??? | Robert S. Minch, D.D.S., P.A. Is Your Smile Ready for a Spring Renovation??? Memorial Day is close at hand and the smells of barbecues and fresh cut grass are already in the air. 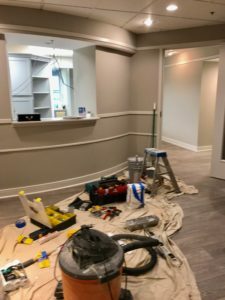 On the other hand, in our office, you might notice the smell of fresh paint and cut wood as we are nearing the finish of our major renovation. If you have visited us over the past month or so, you will have seen the exposed wires and cement floors. After construction, we hope to have a clean, comfortable and modern look. 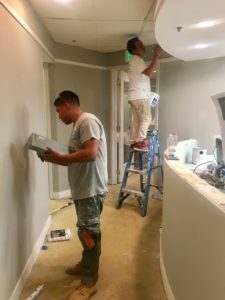 Just like rehabilitating a mouth using the concepts of Complete Dentistry, we are renovating the office by removing the old, tired decor and building a new look from the foundation up. 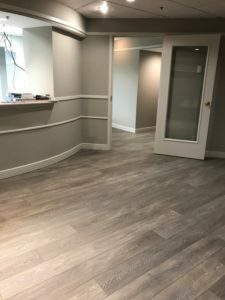 This includes new bathrooms, new flooring, a new reception desk and fresh paint throughout. I want to thank all our patients who have worked with us during this journey and the good news is that it is almost done!! The renovation should be complete by the end of this month and I can already see how beautiful the results will be. Ironically, I still think of our Green Spring Station location as the “new office” (the old office being down Park Heights Avenue) even though we have been here for 26 years!! I guess now I will think of it as the “new” new office! Speaking of renovations, check out our new website www.drminch.com . You will find our updated site that is full of information, pictures of our amazing staff as well as information of some of the latest technology that we use. I am especially proud of the new cases that have been added – they demonstrate what is possible in terms of transforming yellow, crumbling teeth into a dazzling smile using either porcelain veneers or cosmetic bonding. Additionally, there are pictures of new smiles created via Complete Dentistry- treating the whole mouth in order to get the teeth in the right place so that they can be resurfaced for a youthful, beautiful smile. Check out our new website and let us know what you think- we will continue to add new pictures and information from time to time. So now it’s your turn…drink in the Spring aromas and feel the renewal- it is a perfect time to look again at those teeth of yours and ask yourself- “do I deserve the smile that I always wanted?” or “what would it take to get my smile to be more youthful and attractive?’ Better yet, make a time to come in and let us give you some ideas- it can be something as easy as a little bleaching or as ambitious as porcelain veneers for your front teeth. Let’s talk about it and get you on your own Spring journey of renewal. Enjoy the weather and we’ll see you soon! Can’t wait to see the new look! Also, I remember the Park Heights office. You sure have come a long way. Congratulations on the renovation.